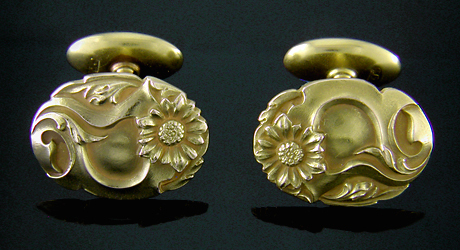 Art Nouveau sunflower cufflinks by the "Maltese Cross" maker, circa 1900. Spring has arrived in fits and starts this year. But, after several days of warm sunshine, the garden is abloom with hyacinth and blue bells, tulips and daffodils. All of which puts me in mind of one of the more florally focused cufflink makers of the early 1900s. In the years around 1900, an unknown jewelry maker (nicknamed the "Maltese Cross maker") created an elegant collection of cufflinks abloom with flowers and foliage. These nature-inspired cufflinks reflected the sinuous curves and tangled forms of Art Nouveau design. The sunflower cufflinks pictured above are a wonderful example of the maker's work. The striking sunflowers and flowing vines (possibly acanthus) seem to spontaneously spring from the richly sculpted gold. Whiplash vine cufflinks, circa 1900. Whiplash curves were a signature of Art Nouveau design. 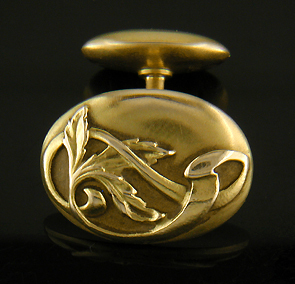 The dramatically flowing acanthus leaves and vines which entangle the tops of these cufflinks are an elegant example. Among the Victorians acanthus was a symbol of the Arts. Jewels featuring acanthus leaves were often given to someone with artistic talent or aspirations. During the Art Nouveau period acanthus leaves and vines were also appreciated for their exotic, sinuous shapes. Laurel sprig cufflinks by the "Maltese Cross" maker, circa 1890. A little less effusive, a little more restrained than the prior cufflinks, this pair features laurel sprigs with berries - an ancient symbol of victory and status. The more restrained design suggests these cufflinks date from the late Victorian period, perhaps around 1890. Based on the style and design of the cufflinks, I believe the "Maltese Cross" maker was active from about 1890 to 1910. Reverse of "Maltese Cross" maker cufflinks. 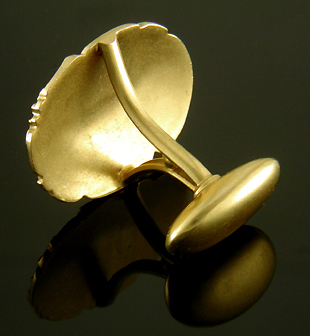 The cufflinks are beautifully crafted in 14kt gold with curved "Y" bridges attaching the tops to traditional bean backs. A small gold ball is set at the split of the "Y". This bridge and back design was also favored by Alling & Company during the same period, although there is currently no further basis for assuming a relationship between the two firms. In addition to dramatic floral and foliate designs, the cufflinks are distinguished by a maker's mark - a stylized Teutonic or Maltese cross within a circular border. The maker's mark is found on the inside of the bean backs along with a "14K" gold purity mark. The above photo of the maker's mark is from the stickpin pictured below. Photographing the inside of the bean backs proved too difficult. The Maltese cross maker's jewels were not limited to cufflinks. 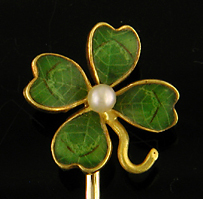 This verdant stickpin is a lucky talisman featuring beautiful enamel work, richly detailed petals and a small pearl. Crafted in 14kt gold around 1900, the stickpin illustrates the "Maltese Cross" maker's commitment to fine design and uncompromising craftsmanship. Recent additions to the Antique Cufflink Gallery include roaring lions by Krementz, dragons set with diamonds, striking white and black "garland and swag" links by WAB, and a sunny pair of yellow and white gold cufflinks. Roaring Lions A fierce lion glares out from behind a golden mane. The lion is richly detailed with a full mane, whiskers and fierce eyes. Created by Krementz & Company in 14kt gold, circa 1900. Dragons and Diamonds The Victorians were mesmerized by a menagerie of fantastic creatures. This dramatic pair of cufflinks features a dragon or possibly a sea serpent fiercely guarding a small diamond. Crafted in 10kt gold, circa 1900. White Garlands Dramatic black and white cufflinks from the Jazz Age. The cufflinks feature garland and swag centers surrounded by geometric box-and-cross borders elegantly accented with black enamel. Crafted in 14kt gold, circa 1925. Yellow and White Yellow and white gold cufflinks that have a warm glow like Spring sunshine. The richly engraved gold surfaces create a warm, shimmering appearance. Crafted by Krementz & Company in 14kt gold, circa 1925.
in the Antique Jewelry Gallery. Additional photos of these and other fine antique cufflinks, can be found in the Antique Cufflink Gallery.